At 120 minutes, Justice League is the shortest film in the DC Extended Universe so far. And yet, somehow, it feels just as long as its lumbering, 150 minute predecessors. Plagued by extensive reshoots, and the loss of its director, Zack Snyder, the film is an unfocused mess that never seems to quite figure out what it wants to be. Warner Brothers clearly wanted a lighter tone than the dour joylessness that marked Snyder's Man of Steel and Batman vs. Superman: Dawn of Justice, and after his departure invited Joss Whedon, who guided the first and second phases of the Marvel Cinematic Universe, to finish the film. The result is a strange amalgam of the two filmmakers' distinctive styles. The film's color palate is muted and filled with Snyder's trademarked slow motion action shots, but peppered with Whedon's quippy sense of humor. The result is less of a "best of both worlds" scenario and more of a "worst of both worlds" scenario. The plot centers around Batman's (Ben Affleck) continued efforts to round up a band of superheroes to fill the void left by the death of Superman (Henry Cavill). His cause becomes even more urgent by the arrival of Steppenwolf (Ciaran Hinds), a generic villain of the week out to destroy the world for...some reason. So he and Wonder Woman (Gal Gadot) set out to track down The Flash (Ezra Miller), Aquaman (Jason Momoa), and Cyborg (Ray Fisher), to enlist their help in order to save the world from certain doom. Unlike the MCU, DC has had little time to set these characters up before thrusting them all together. 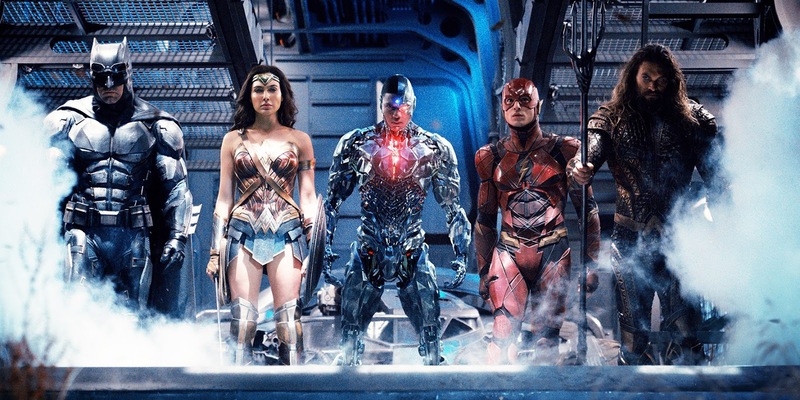 The only characters who have had their own films are Superman and Wonder Woman (whose film remains the single bright spot in the DC universe), so Justice League spends an inordinate amount of time setting up half of its heroes before they can even begin their quest. The same issue plagued the ill-conceived Suicide Squad just last year, and it doesn't seem like anyone has learned anything. In fact, the only real highlight of the film is Danny Elfman's score, which brings back his original, 1989 Batman theme, along with John William's iconic Superman theme. While I was an admirer of Hans Zimmer's previous work for the series, it's hard not to feel a thrill at hearing that classic Batman theme supporting the character once again. The rest of the film, unfortunately, lacks the personality of the films those themes were originally written for. Justice League is a bland, generic superhero film that is nearly drowned in garishly computer generated effects. Even Henry Cavill's face has been CGI'd into oblivion, in order to cover the mustache he had grown during the reshoot period. For a movie with a budget as bloated as this, the quality of the visual effects is shockingly low. Steppenwolf looks like a cartoon, and very little in this world seems tangible. That's part of what sinks Justice League - it's trying to be a cartoonish comic book adventure set in a realistic world, and it just doesn't work. It's a step up from Batman vs. Superman, but that's not saying much, especially considering how good Wonder Woman was. Everything about this just seems rushed. DC has been playing catch-up with Marvel without seeming to understand that they don't need to be Marvel. The Dark Knight Trilogy was better than any single Marvel film, and yet here we are, five films into a cinematic universe that still doesn't feel cohesive or particularly well planned out. There seems to be no guiding vision, and Justice League is just another symptom of a larger problem that doesn't bode well for the DCEU moving forward. 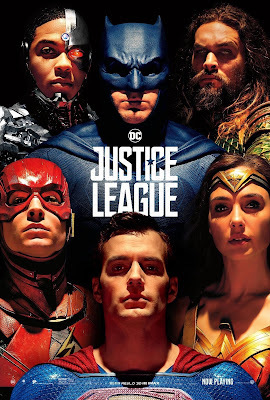 JUSTICE LEAGUE | Directed by Zack Snyder | Stars Ben Affleck, Henry Cavill, Amy Adams, Gal Gadot, Ezra Miller, Jason Momoa, Ray Fisher, Jeremy Irons, Diane Lane, Connie Nielsen, J.K. Simmons, Ciarán Hinds, Joe Morton | Rated PG-13 for sequences of sci-fi violence and action | Now playing in theaters everywhere.